These days, it seems like everyone and their mother has a BB cream out. Now, I didn't get on the BB cream bandwagon when it first started so I've yet to try any traditional Asian BB creams. I think that I've been hesitant to try them because, while they are supposed to be these magical a million-in-one products, they just seem like tinted moisturizers to me - which are products that I like, don't get me wrong, but I've already got enough of those that I enjoy. Many of the BB creams are also a one-color-fits-all kind of product, which I'm always leery of, and I've read that others have a grayish cast, which kind of freaks me out. But I was at Sephora a couple of weeks back, and found myself a little curious about the BB creams put out by some of the major makeup companies. In particular, I was interested in the offerings from Smashbox and Too Faced, simply because I'm a fan of both of those companies. Still, I couldn't see shelling out the money - and these BB creams aren't cheap by any stretch of the imagination - for what was essentially a tinted moisturizer. The selling point of these babies for me, though, is their SPF - Smashbox offers SPF35 and Too Faced offers SPF20 - so when a salesperson at Sephora offered me samples of each, I was certainly happy to take them off her hands. And she was pretty generous with the samples, so I got about four uses out of each - enough for me to come to a consensus on which one I liked better. 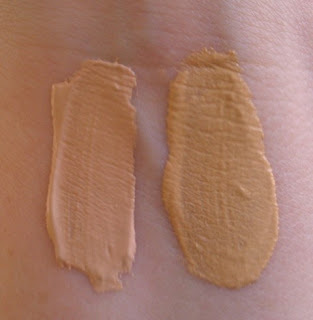 I'd like to go on record, though, and say that I don't really see how these are different from your basic tinted moisturizer (with a slight caveat for one of them), so if you have a tinted moisturizer that you like anre aren't in the market for a new one, you can probably skip both of these. Of course, I got the samples in the lightest shade of each BB cream - for the Smashbox, that means Fair and for the Too Faced, it's Vanilla Glow. Both of them are probably a tinge too dark for me, but since they're not as opaque as a traditional foundation, it's not a serious issue. However, the Too Faced Vanilla Glow has a decidedly yellow cast that isn't especially flattering on my fair, cool-toned skin. On the other hand, the Smashbox Fair is more neutral so it blends in pretty seamlessly with my skin. Both formulas are fairly thin and lightweight, so they don't feel heavy or cakey on the skin. 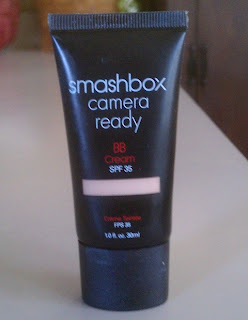 However, in terms of coverage, I think the Smashbox BB cream wins. While most of my freckles and acne scars are still visible, it blurs all the unevenness so it's virtually undetectable. 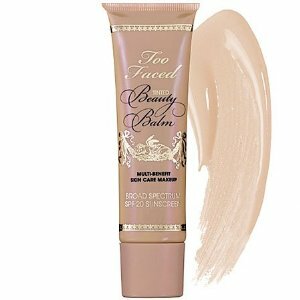 The Too Faced BB cream behaves more like a traditional tinted moisturizer in that its coverage is pretty sheer. Both have a dewy or satin-y finish as you'd expected with a lightweight, moisturizing product, but somehow the Smashbox product, with its more intense coverage, looks more natural on my skin. The one area where Too Faced's BB cream has it all over the Smashbox is in terms of value. TooFaced's full size version offers 1.5 fl. oz. 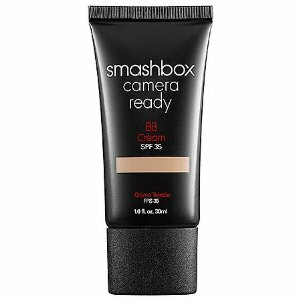 for $32, while the Smashbox cream provides 1 fl. oz. for $39. That's a fairly noticeable difference in price per ounce - about $21.33/per ounce for the Too Faced and $39 for the Smashbox). Still, when push came to shove, I did decide to buy a full size of the Smashbox BB Cream. While it is essentially a tinted moisturizer, it offers better coverage than any of the tinted moisturizers I've tried (well, the Josie Maran Tinted Moisturizer comes pretty close, actually. That stuff is great) and the SPF35 is more than any of them has too. I suspect that I'm really going to love this during the summer when I prefer lighter coverage from my face products. Oh, and if you're curious, I use my fingers to apply the BB cream - I think that method provides the best overall coverage and finish. Are you a fan of BB creams? What are your favorites? Have you tried the Smashbox or Too Faced versions? Vanilla glow isn't the lightest shade though. Snow glow is.